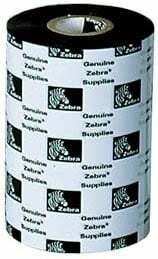 The Zebra 5095 Performance Resin is a performance resin ribbon for printing high-density barcodes and high-resolution graphics on a wide range of materials from matte to gloss synthetics. Offers exceptional print quality, durability and chemical resistance. UL recognized and CSA component acceptable when used with Zebra approved labels. The Zebra 05095BK11030 is also known as ZEB-05095BK11030-C	.